It is sobering to acknowledge that more than 30 years have passed since The Long Good Friday was released to ﻿the British audience. Film more than any other medium, has the power to jolt us into this recognition of time passing. The viewing of a striking piece of cinema can stay with one for a long time and combining this power of recall, with the massive audience that a movie can be exposed to ( as compared to the more intimate reach of say a stage masterpiece, restricted to only one theatre, rather than a general release to cinemas) and a film, especially one that is popular, can very quickly be established as a recognised moment, or milestone, in a society's cultural history. The Long Good Friday is one such seminal and popular movie. I first saw it on its release in 1981 having just finished my A levels and having grown up in 70's London. The film’s impact then was breathtaking. The storyline was brave and credible. The screenplay was from Barrie Keefe, whose mastery of the nuances and grit of London at the start of Thatcher's 80s had an almost Dickensian accuracy for its time and with a soundtrack that at all times complemented the graphic and often brutal imagery of the movie. And atop this excellence, a collection of performances that would go on to define many celebrated acting careers, all deftly helmed by the perceptive eye of the late John Mackenzie. So why write these thoughts right now? A chance scan through Twitter this week told me of a screening of the movie, at a small screen in Stratford E15, followed by a Q&A with producer Barry Hanson. How to resist? I rarely visit this part of London (though when I do, to visit the Theatre Royal Stratford, the entertainment is usually excellent) and so to arrive and witness the dominance of the Olympic park construction bestriding the area, the resonance of the film’s vision for how London was even then on the cusp of change, rang so true. The film's story follows the decline of a "traditional" East End gangster Harold Shand, who fails to recognise the power of the tentacles of an Irish politically based terror campaign that is methodically waging a violent and destructive war against his Corporation. A sub plot depicts a relationship that Shand is seeking to cultivate with the US mafia to fund the development of a future London Olympic park and who have sent two key players over from New York to negotiate with him. 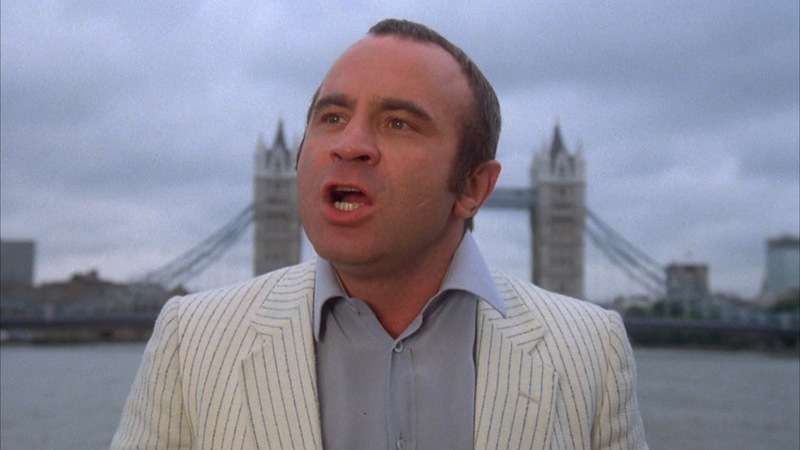 As he is betrayed and his empire disintegrates not only before him but humiliatingly, in front of the Mafia stooges too, Shand's rage, disbelief and inability to cope with the new world order, is a masterful performance by Bob Hoskins. Helen Mirren plays Victoria, a youthful but smart moll/wife to Shand, and it was interesting to hear from Hanson, and indeed to concur with him, that in his opinion, throughout the story, it is Victoria who is perhaps the most powerful and manipulative character of all. ﻿﻿But Hoskins and Mirren, whilst the two star names of the movie, led a cast that had not only aspects of the UK's established best - Dave King as a deliciously bent copper stands out - but so many other names who were to reach later stardom. That Pierce Brosnan, a future James Bond no less, as a young bare chested Irish assassin barely features on the credits and Derek Thompson who played a critical role in the film's story and who was to go on to lead the cast of BBC TV's Casualty drama series but who was professionally unknown at the time of filming, is a measure of the quality of the production's casting. I make no bones about it: I admire and enjoy the film. Keefe's script is as timely today as it was then and his writing, combined with Hoskin's unique vocal style, is the blackest of comedy. The writer has a talent for penning moments of deepest London based Blitz-spirit irony. Hoskins' farewell speech to the Americans in particular shines, though the script is peppered with wryly observed gems, brilliantly delivered. With the London Olympics about to start, and Operation Elveden digging into police corruption, to echo just two of the films themes, the story's message remains as relevant today as it was at the start of the 80s. If you've seen the film before dust down the DVD or rent it from iTunes/Netflix, and watch it again. If you haven't yet seen it, then do so. 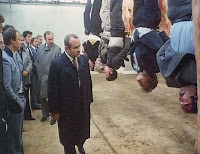 The Long Good Friday is British filmmaking at its best.